This story starts on the dusty roads of Niksan Market in Khulna. Tucked away in its alleys was a small jhupri next to the railway station. A boy by the name of Kamruzzaman lived there with his two brothers, sister, mother and father. Ragged bits of cloth and cardboard were their guardians from the blistering sun, the evening chill and the rain. His family had never been to school, they got by on odd jobs around town, and they had not dared to dream for more for him. But Kamruzzaman had an insatiable thirst for knowledge and a passion for books, and this passion blazed through the alleys of Niksan Market. Perhaps the pages of the books allowed him leave his jhupri temporarily, or perhaps they just helped take his mind off his empty stomach. But it was undeniable, he was gifted. His neighbours and the merchants he met every day were mesmerized by him and eventually helped him enrol in to primary school. Exceptionally bright, Kamruzzaman excelled at academics, and seeing his merit and perseverance all his teachers offered him after school tutoring sessions, bought him books, notebooks, and supplies for school, they even waived his school fees. Despite his struggles at home, especially after the death of his father, Kamruzzaman devoted himself to his education. All through Primary School Kamruzzaman had come out top of his class! His teachers, the neighbourhood people, and his family all came together to fight for his admittance into high school. His exemplary academic records and dedication, along with their support won him a spot in high school, free-of-charge. Now in high-school, things started to change. His work load had increased and the stress of the next few years slowly piled up. But Kamruzzaman, tucked away in his jhupri, still fought hard and once again came out on top all through high school. But he knew the next step would be daunting and shortly after high school his intermediate exams were ahead of him. He knew these exams would determine much of his future prospects. Yet he had no place to go after school where he could give time to his studies. There was no light at home to read his books under and rarely enough food on the table to quieten his writhing stomach. Seeing his frustration, his mother sent him to a nearby masjid. The Imam there noticed him immediately and invited him into his home, gave him shelter and tutored him. Soon after, Kamruzaman started to spend his nights with him at the masjid, sleeping in the veranda. The Imam saw Kamruzaman’s potential and he took it upon himself to take care of this boy. He offered to pay for books and supplies and even examination forms and fees. Furthermore, Kamruzzaman started tutoring children as well. He had a rusty old bicycle which he would ride to school, to work and then to tutoring. The little he made he gave to his mother. Regardless, he never once dropped from his position of being first in his class. With the Imam and his teacher’s help, Kamruzzaman earned an A grade on both his SSC and HSC exams. Right up to this moment in Kamruzzaman’s life he had spent a total of Tk. 500, less than US$7, on his education, the rest was provided by his teachers and the Imam. He had experienced the overwhelming goodness that is innate in human kind. With every success he dreamt of doing greater things and going further than he had ever imagined. Kamruzzaman wanted to go to university. Not just any university. He wanted to go to the University of Dhaka, the fore most education institute in Bangladesh. Not unexpectedly, he applied and he was granted admission. Kamruzzaman travelled to Dhaka, for the first time leaving his family and the Imam behind. In Dhaka he didn’t know many people, just a stepmother and stepbrother who lived in the small village of Golam Bajar. His step brother’s son earned a living by driving a van around town. He gave Kamruzzaman the money for his university fees. At the university, he majored in World Religions and Culture. Alongside classes, he also sold juice and made thongas, little paper bags, in a small rented room to help ease his step family’s burden. He didn’t dare to tell them lest they forced him to stop. However, Kamruzzaman could no longer allow himself to encumber his step family anymore, and so he tried to get by on the little he had saved. But life was getting tough. He lived so far from school, worked daily for long hours, and had very little money for daily life, let alone to further his studies that it had started to affect his university life. It had come to the point where he had almost dropped out of university due to the stress and financial constraints. In his hour of need he became close to one of his professor’s from Dhaka University, Dr. Kazi Nurul Islam. He is Professor and Founding Chair of the Department of World Religions and Culture at Dhaka University, Founding Director of Dr. Mahanam Foundation for Peace and Solidarity, Founding Director of Swami Swarupanda Foundation for Moral Education and Interreligious Harmony, Dhaka University to just name a few of his qualifications. He is also the President of the International Association for Religious Freedom (IARF), Bangladesh Chapter, Secretary General of the Inter-religious and International Federation for World Peace (IIFWP), Bangladesh Chapter, Secretary General, Universal Peace Federation (UPF), Bangladesh Chapter. The Professor had noticed that Kamruzzaman’s quality of work had started to slip. He approached Kamruzzaman to inquire. This was when Kamruzzaman opened up and told the Professor about his life and Professor Islam became an advisor and confidant to Kamruzzaman. The Professor had heard about Palli Karma-Sahayak Foundation (PKSF) and the service it offered from a colleague and immediately made contact with the foundation’s senior officials in his second year of University. PKSF, touched by Kamruzzaman’s story, registered him in to the Special Fund. The Special Fund was initiated in the year 2010 in order to help the poor facing financial burdens or crises. It started with a 5 crore Endowment Fund of which 76.15 lakh has already been distributed to projects such as a BDT 2,000,000 Financial Grant to the Prime Minister’s Relief and Welfare Fund for the Rana Plaza Victims, building a Children’s Care Center for the Rana Plaza victims in Savar, providing winter supplies for the poor in the Dinajpur Region, and also providing educational support to students from poverty stricken backgrounds. And PKSF was just in time! This was just the boost Kamruzzaman needed. 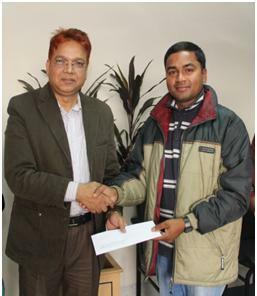 PKSF provided Kamruzzaman with an education grant of Tk. 60,600 which he received in the form of cheques over three years, 2011 to 2014. With this money, Kamruzzaman was able pay his tuition fees, get a room in the university dormitories and take a much deserved break from his struggles. Kamruzzaman worked hard and had achieved a Bachelor’s Degree with honors. Soon after his graduation Kamruzzaman enrolled into the master’s program. Now Kamruzzaman is back at the top of his class, awaiting his final grades. He tutors students to earn some money. With his own savings he helps fix his mother’s house in Khulna. He bought her a tin roof so that she can now sleep soundly through the rain. He even single-handedly paid for his second brother’s and sister’s weddings. Today, he still calls that tiny jhupri in Niksan Market his home, unable to forget his roots. His eldest brother is currently married and lives with his wife in Dhaka, they don’t speak anymore. His second brother is currently unemployed. His sister has separated from her husband. Kamruzzaman thinks of home and hopes to find a job soon. He now waits for the day he can take his mother and sister by the hands and give them the home and the life they deserve. He is eternally grateful to his neighbours, teachers and the Imam and hopes that someday he may be of service to them. PKSF comes face to face with such promising individuals all the time, who are bogged down by the pressures of society and money that they cannot reach their full potential. PKSF has taken on the task of not allowing our country’s people to go on in vain. This is the purpose of the Special Fund. This is the purpose of PKSF.